Tinnitus can manifest as an acute symptom lasting just a few days, or a chronic or recurring symptom lasting weeks, months or years. It is often described as a ringing in the ears, but is also reported to sound like hissing, buzzing, roaring, sizzling, clicking or other noise. If you’re one of the five percent of Americans suffering from tinnitus that is “moderately to significantly annoying,” it’s a great idea to visit a hearing specialist for an evaluation. Our top team of audiologists is equipped with many tools and strategies to help patients with tinnitus, but first we need to assess your condition. Identify the underlying cause of your tinnitus symptoms. Determine if your tinnitus is subjective or objective. Evaluate how your tinnitus is affecting your speech reception. Assess whether you’re experiencing hyperacusis (sound sensitivity). Pinpoint the frequency and loudness of the sound you’re hearing. Tinnitus is a symptom of a wide range of health conditions, and it can occasionally point to a more serious problem that needs professional medical attention. This is why trying to identify a cause is important, even though it may not be possible. Subjective tinnitus – meaning tinnitus only you can hear – is much more common and is often caused by ototoxic medications or one of many audiological, neurological, metabolic and psychological conditions. Objective tinnitus is much rarer and is often tied to underlying vascular or neurological problems. If we can determine a diagnosis and address the condition causing your tinnitus, we may also be able to treat that condition and relieve your symptoms. 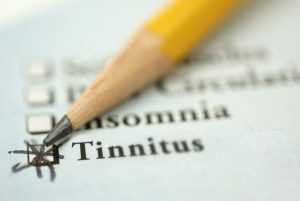 If we can’t identify a specific cause of your tinnitus, we will recommend other treatment options. An in-depth written and verbal interview. A complete physical examination of your auditory system. A pure tone and ultra-high frequency audiometry test. Speech reception and word recognition tests. Additional tests, studies and evaluations.